Will anyone go to jail over Volkswagen emissions scandal? Will anyone go to jail over Volkswagen diesel scandal? Volkswagen is racing to identify who was to blame for rigging diesel emissions data in the U.S., and possibly across Europe too. The company says anyone involved will face the "full consequences," and it has promised to work with German prosecutors on a criminal investigation. So will anyone end up going to jail? The German automaker has admitted deliberately programing half a million diesel-powered cars in the U.S. to emit lower levels of harmful gases in official tests than on the roads. They may have been pumping out nitrogen oxides at 40 times the permitted level. Employees held responsible could be prosecuted for fraud. If convicted, they face big fines and could be sentenced to a maximum of 10 years in prison. Prosecutors would have to prove that the Volkswagen (VLKAF) employees distorted facts to trick people into buying their cars. 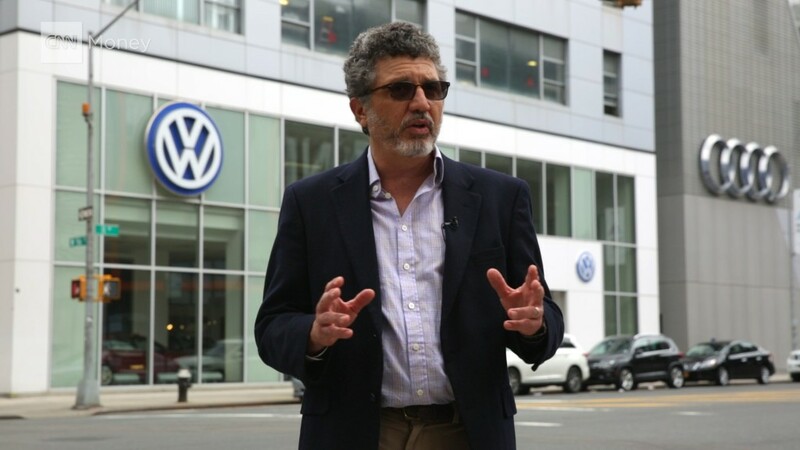 Volkswagen has been promoting itself as a sustainable automaker for years, and its "clean diesel" cars were a hit with customers. "They are positioning themselves as the champions of sustainability. Saying 'we are the green car company' was a big part of their marketing strategy," said Theo Vermaelen, a finance professor at INSEAD business school. Lying about emissions to convince people to buy Volkswagen cars would be considered fraud, legal experts say. Under German law, fraudsters can be sentenced to a maximum of five years in prison, rising to 10 years in "especially serious cases." Those cases include fraud committed for commercial reasons. If prosecutors prove Volkswagen employees installed the software for the financial benefit of the company, or that more than three people were working together on the scam, they could prosecute under those harsher terms. Anyone found guilty may be fined as much as 360 times their daily net salary. A spokesman for Volkswagen said the company is determined to take to court people from inside the company who "did not obey the rules." The company itself can't be prosecuted for fraud in Germany because criminal law only applies to individuals. But Volkswagen could be fined heavily under the administrative offenses act for allowing the fraud to happen. Similar cases in the past resulted in penalties totaling hundreds of millions of dollars. Siemens (SIEGY) paid fines of almost 600 million euros ($675 million) for bribery in 2007 and 2008, while engineering company MAN received a fine of 151 million euros for corruption in 2009. Volkswagen has set aside 6.5 billion euros ($7.3 billion) to cover vehicle recalls, and other costs, but that figure may be nowhere near enough. It is already facing dozens of civil lawsuits in the U.S. from people claiming their cars are less valuable due to its emission testing scandal. Evidence of deliberate manipulation in European countries would trigger similar actions. And it may also face prosecution for environmental offenses in the U.S. A Department of Justice spokesman said federal prosecutors are taking the allegations "very seriously." New York Attorney General Eric Schneiderman said his office has launched a criminal investigation. -- CNN's Chris Liakos contributed to this article.